“This is a real treasure and a great learning tool for synthesizers. 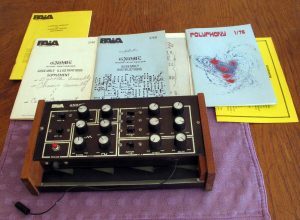 This multi-voice synthesizer from the mid-1970s was built from a kit and worked when it was retired, though I can’t promise it will now. It is solid-state, though, so why not? The schematics, procedure instructions, glossary, and setting/operating instructions are included so you can experiment away. Learn how the various electronics produce the sounds and learn how to control them. This is a nice, quality device.